From left: Eunice Githae GC ‘15, Faisa Loyaan (past SPI participant) and Carol Makanda GC ’15 talk with Beatrice Elachi, a Kenyan senator, at the founding conference of DAWN. 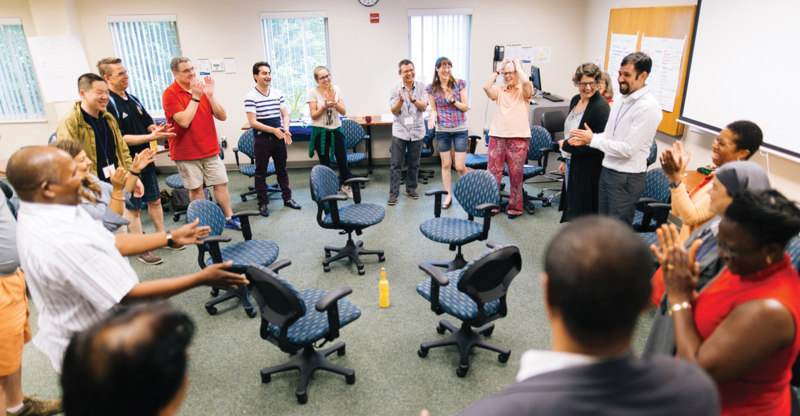 Rosemarie Bello Truland, a lawyer who teaches sociology at Brookdale Community College in New Jersey, found inspiration at the 2017 Summer Peacebuilding Institute (SPI) in the restorative justice and community organizing class. Truland plans to integrate restorative justice into the gender studies courses she teaches, to design introductory programs for criminal justice students, and to network with a classmate who works with victims of domestic violence. The skills taught for 22 years at SPI have always been relevant to people in the United States, says SPI director Bill Goldberg MA ’01, but now they have a renewed significance in the serious challenges the country faces. 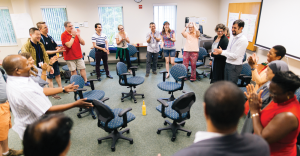 New offerings at SPI in 2017 included four courses that directly addressed how to manage and transform divisive rhetoric and communication; how to bring polarized communities together and organize for change; and how to recognize and analyze systems of oppression. These courses attracted 54 students (out of 175) from around the United States, as well as global peacebuilders seeking to make progress on similar issues. That’s what Goldberg hopes to hear in the coming months from U.S. peacebuilders who attended SPI and now continue to work at transformation of their relationships, communities and organizations.